CE Marking is a mandatory conformity requirement for products sold in the European Economic Area (EEA) and has been in place since 1993. It shows that the manufacturer has declared that the product meets the requirements of the applicable EU Directive or Regulations. From July 1st 2013 a very significant and important change will take place in regard to the sale and installation of external windows and doors. As of this date, it will be a legal requirement, the same as for the rest of the EEA, that all external windows and doors offered for sale in the United Kingdom are CE Marked. Conformity of declaration for external window and doors is to be made under the EU Construction Product Regulation, harmonised standard BS EN 14351-1+A1:2010, thereby enabling the affixing of the required CE Mark. 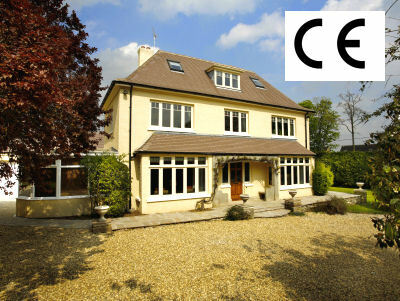 All of our products are now affixed with a CE Marking Label, when sold glazed. This label outlines; the type of product, year of manufacture, the unique reference number, the intended use / application, any dangerous substances, the load bearing capacity of safety devices (if applicable), the Thermal U-value and the Window Energy Rating or WER (if applicable) of the purchased product. Duration Windows has always been committed to providing the very highest quality aluminium windows and doors and continues to ensure they are consistently tested to rigorous UK and European standards. This approach has been for the satisfaction of our customers, and we have likewise now formalised the process to enable CE Marking of all our products. What’s more, along with each of Duration’s aluminium windows and doors, every Customer will receive additional required documented details of declared conformance, providing piece of mind that our products comply with EU Regulations.